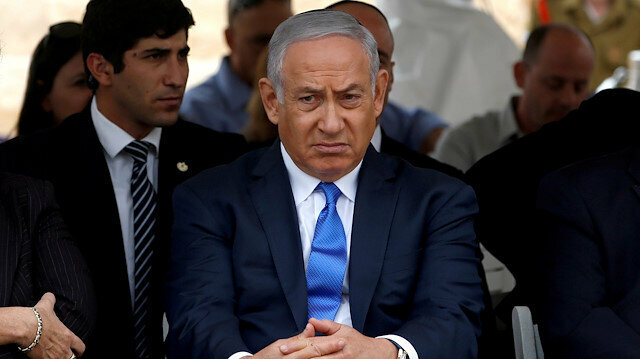 Israeli Prime Minister Benjamin Netanyahu said he would make a last-ditch effort on Sunday to avoid the collapse of a coalition government weakened by the resignation of his defence minister. Israeli Defense Minister Avigdor Lieberman on Thursday submitted his resignation to Prime Minister Benjamin Netanyahu one day after announcing his intention to step down from the post, according to the Israeli Broadcasting Authority (IBA).On Wednesday, Lieberman announced his decision to resign in protest against a ceasefire deal hammered out one day earlier between Israel and Palestinian resistance factions.The hardline defense minister announced his intention to step down at a meeting of members of his Yisrael Beiteinu party, during which he reportedly described the Hamas-Israel ceasefire as “a surrender to terror”.Following Lieberman’s resignation, Education Minister Naftali Bennett threatened to withdraw his right-wing Jewish Home party from Netanyahu’s Likud-led coalition government unless he was given the defense portfolio following Lieberman’s exit.Netanyahu is now reportedly holding intensive consultations with several party leaders in hopes of heading off the crisis now facing his shaky coalition government.Sources close to Netanyahu reportedly told the IBA that the prime minister was considering making Bennett defense minister in hopes of keeping the latter’s party in his governing coalition. Failure by Israel's coalition leaders to reach agreement on cabinet positions has increased the likelihood of early elections, Israeli media reported on Friday.The reports came after Israeli Prime Minister Benjamin Netanyahu met with coalition partner Naftali Bennett, who is seeking to fill the soon-to-be vacant defense ministry post. But he is thought to be facing opposition from other partners in the right-wing government, the reports said. Hundreds of Israelis demonstrated in Tel Aviv on Thursday to demand the resignation of Prime Minister Benjamin Netanyahu for a cease-fire deal with Gaza-based Palestinian factions.Around 400 protesters from Jewish settlements around Gaza set off a demonstration against Netanyahu by blocking traffic on one of the main roads in Tel Aviv’s city center.Protestors denounced Netanyahu’s decision to approve the cease-fire deal and accused him of falling in leading the country. "The south will not be silent anymore," said banners carried by demonstrators.Protesters said the Netanyahu government was insufficient in providing security in the Jewish settlements in the south of Israel; with slogans that included, "Bibi we don't need you, go back home. "Video: Israelis call on Netanyahu to step down over Gaza truce"We're paying the government to solve the problems. We want these people to do their job," said protester Adele Raemer.On Wednesday, scores of Israelis demonstrated outside the Knesset in Jerusalem to call for the Netanyahu’s resignation.Since Sunday, at least 14 Palestinians have been martyred by Israeli airstrikes and artillery across the blockaded territory.On Sunday night, an Israeli officer was killed -- and another injured -- in a botched ground operation in Gaza.Tensions appeared to ease slightly Tuesday after Israel and Gaza-based resistance factions agreed to an Egypt-brokered cease-fire.Since 2006, Israel has been keeping the Gaza Strip a land, sea and air blockade. Anadolu Agency has visited a number of sites in the blockaded Gaza Strip, including a kindergarten, that were recently destroyed by Israeli airstrikes.During the most recent escalations on Monday, Israeli forces targeted residential buildings, a kindergarten, a television channel and sites associated with resistance faction Hamas.Israel has claimed that it only struck military installations, but destroyed children’s toys, singed pieces of furniture, burnt notebooks and shattered broadcast equipment -- all of which were pulled from the rubble -- strongly suggest otherwise.Anadolu Agency began its tour at the Shahd kindergarten, which was completely destroyed by Israeli attacks in Gaza City’s western Rimal district.In the debris of the kindergarten, which is run by Palestinian teacher Ebtisam al-Yazji, broken seats, burnt books, and ruined toys can be seen scattered all over the ground.Video: Rubble of ‘al-Aqsa TV’ building following Israeli bombing"Hours before the bombing, there were 200 children playing, taking their lessons, drawing and making clay sculptures," al-Yazji told Anadolu Agency while collecting furniture and toys that remained unaffected by the bombing. "The children will not be able to come to kindergarten again. Israeli raids have destroyed almost everything and the building may be in danger of collapsing," she added.Adjacent to the kindergarten, there is a seven-story destroyed residential building called Al-Yazji. The building contains 14 apartments and a number of stores. It was struck by more than 10 rockets.Palestinian child Yazan al-Yazji, 12, showed an Anadolu Agency correspondent his damaged flat. The Israeli bombing divided the building into two halves, one of which was totally destroyed. "Most of the people in this building are doctors; I do not know why Israel bombed them. There are no military facilities here," the young boy said.He added: "I do not know how I will go to school tomorrow. My books, my bag and my school clothes have been burned. We fled the house after being hit with the first shot with only our clothes. "In Rafah city, a home that accommodated 10 members of the Dahir family, was struck by four Israeli rockets.After the first rocket destroyed a room in the house, the mother rushed to protect some of her children and let the rest run outside. They ran for their lives some 350 meters from the house to a nearby alley.In four minutes, three rockets struck a vacant lot in the middle of five houses, leaving several homes completely destroyed. "The bombardment destroyed our house and our lives," Kamel Daher, a member of the family, told an Anadolu Agency correspondent. "Our fodder company, which is adjacent to the house, was also completely destroyed. The Israeli rockets destroyed everything," he added.Al-Berim in Khan Younis city lived the same tragedy -- their home was destroyed the same night by three rockets. "Look at this deep hole: as if a volcano had exploded at the bottom of the house,” Nasrullah al-Berim told Anadolu Agency.“I do not know why Israel uses all this force against us. We are civilians; we do not pose any danger to them," he said.Fighting to hold back his tears, he looked at the scattered stones of his house. Along with his children and grandchildren, he gathered up pieces of unbroken furniture and some books.The Israeli airstrikes also destroyed the Al-Amal Hotel and the Hamas-run Al-Aqsa television channel.At least 14 Palestinians have been martyred by Israeli attacks in Gaza since Sunday.Tensions appeared to ease slightly late Tuesday after Israel and Gaza-based resistance factions agreed to an Egypt-brokered cease-fire.Since March 30, more than 200 Palestinians have been martyred by Israeli army gunfire -- and thousands more injured -- while taking part in ongoing rallies along the Gaza-Israel buffer zone.